Every club manufacturer on earth claims their latest, greatest driver delivers more distance… More distance than your current driver. More distance than the competitor’s driver. More distance than the driver they just introduced six months ago. C’mon! How can that be? “More distance” is such an over used, overblown claim, it’s become an industry cliche. Think about the realities of the marketing hype. Even if you could learn to hit the ball 300 yards off the tee, you still have to get the ball on the green. And to do that, you need distance control, not just distance. There’s nothing worse than hitting a great drive, right down the middle of a par-4, and then making a double bogey from a 120 yards out. It’s what they call an “unforced error” in tennis. The most common miss in that sort of situation is short of the green, or short and right. Maybe in a bunker, or facing a difficult chip. Then you find yourself in chip-ville hell… across the green in three, on the green in four, and two putts makes six. Doesn’t matter if you were 150, 130 or 110 yards out after your drive. If you don’t have distance control with your irons, you’re going to make a lot of those sixes. What about those long par 5-s that you dread so much? You can hit the longest drive of your life, a great second shot with your 3-wood, and it makes no difference. You’re still faced with some sort of approach shot with an iron. An approach shot that demands distance control and accuracy. 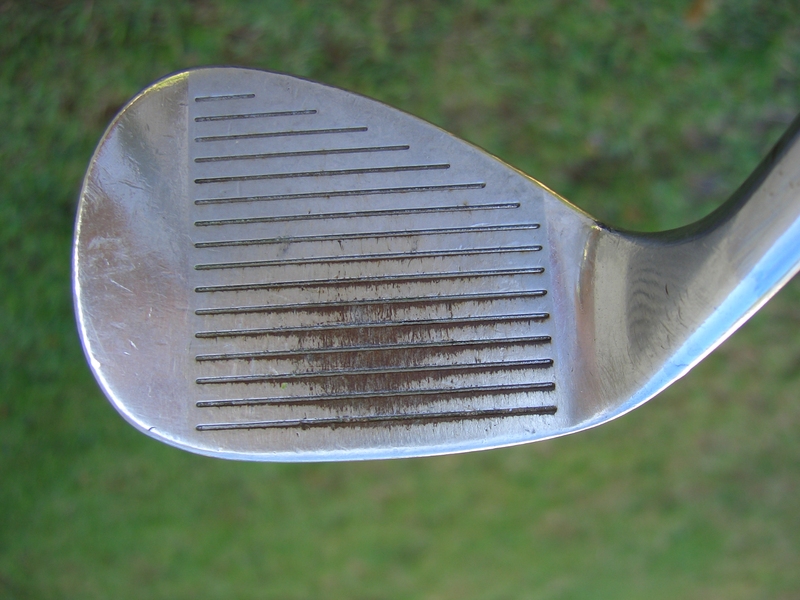 This is what predictable distance looks like in an old, worn-out wedge. So yeah. Distance off the tee is nice, but when it comes to scoring, it’s nothing compared to distance control and accuracy with your irons. 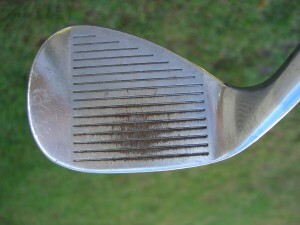 And that’s a matter of hitting the ball squarely in the middle of the clubface. Everyone does that at least three or four times a round. You know the feeling… when you hit that iron shot so pure that it just seems to fly effortlessly toward the target. Well, GNL Golf can teach you to do that 20 or 30 times a round. Imagine what that would do for your scores. They say that golf is mostly a matter of managing your misses. Center impact translates to consistent distance and much better accuracy. So even your short iron “misses” will find some part of the green, most of the time. And guess what… center impact also translates to more distance off the tee. So you can actually have the best of both worlds.